Special weekend price not always availble. p>Cars must not be more than 2.01 metres high. Trailers are not permitted. Free battery start available. On arrival take a ticket from the entry barrier and park.On your return drive to exit, press intercom & quote booking reference number as proof of payment. At exit please insert your ticket for your booking to be validated. 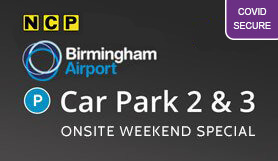 On entry to the airport follow the signs for Car Park 2 & 3.